As you may know, this is not an easy task. If you have ever taken on a new fitness routine or nutrition plan (I hate the word diet! ), you know how hard it is to stay consistent. Personally and professionally almost everyone that I know has some sort of “wish list” that includes things like losing weight, getting more fit, running a 5k and/or doing a triathlon. Kendrick has taken on EVERY aspect of changing his life. He took a good long, hard look at how he was eating. He started to exercise consistently for the FIRST time in his life. He changed the time that his alarm goes off as he now wakes up many mornings to train BEFORE work (luckily he is often greeted by a smiling face– mine or Coach Keith's!) and he has started to challenge himself by participating in races! Kendrick’s first race was the 2011 NYC Triathlon; as you know from our blogs it was an amazing day, filled with celebrations and lots of tenacity and hard work from Kendrick. 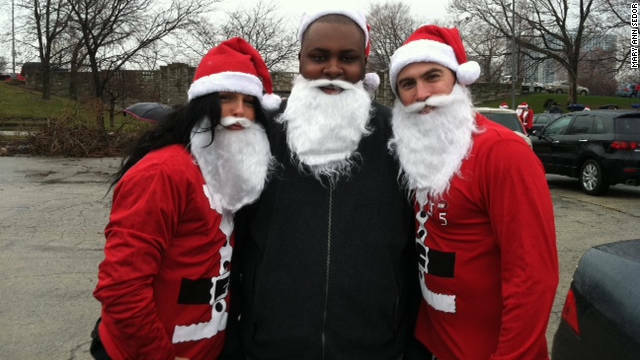 Since the NYC Triathlon Kendrick has run two 5ks, most recently the “Santa Hustle” here in Chicago. Kendrick still has a lot of work to do to really get strong and fit, but as you know - if you have ever tried to make a significant lifestyle change - it takes time. There are changes to be made on emotional, physical, and spiritual levels that don’t happen overnight. Coach Keith and I continue to work with Kendrick and we continue to see changes. It is a journey that is still fun and still amazing to be a part of for all of us. Last year Kendrick signed up for the Santa Hustle and did not participate. This year Kendrick signed up again (on his own without prompting from his coaches) and ran the race despite cold weather, rain and two coaches making him take pictures in a Santa hat and beard. Kendrick’s journey continues and the hard work, fun and celebration of Team Henley keep coming as well. Happy Holidays to you and your family -– may you find and succeed in your personal journey to health and wellness in the coming year. Way to go Kendrick. You have fantastic trainers and are doing such a great job. Keep up the good work! I also wanted to add....I love this picture of the three of you...MERRY CHRISTMAS & HAPPY NEW YEAR! Thanks Andrea! Happy Holidays to you and yours too!! I am *this close* to signing up for a thirtalon. I think the only way I'll ever get it done is to just register and train out of fear. Maybe that's not normal, but I never claimed to be normal. Since you went for it, I think I need to take the leap.Becky recently posted..